The book was too big for one paperback, so to get the paperback version, take both links below. I divided the book approximately in half for the paperback version. Windows MFC Programming II is an intermediate Windows MFC Microsoft Foundation Class programming textbook, replacing my now out-of-print Intermediate MFC. The book assumes that the reader is skilled in basic Windows MFC programming and proceeds to cover many more advanced topics, especially printing and complex document view handling. Database access is presented as well as many other more advanced topics and controls, such as the list and tree views and property pages. How to write ActiveX controls and multithreading are also presented. Designed for a college level course or for the experienced self-taught, Windows MFC Programming II covers many advanced Windows MFC (Microsoft Foundation Classes) C++ Programming topics. It is designed to provide you with the skills needed for an entry level career in Windows MFC programming. Just check out the table of contents to see what I mean. 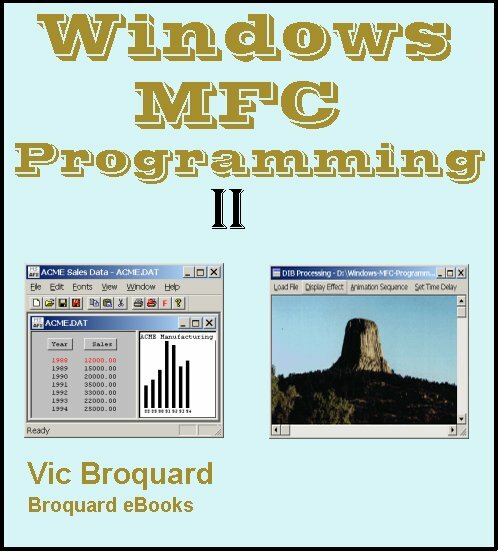 Windows MFC Programming II assumes that the reader already knows basic MFC programming, covered in the previous book, Windows MFC Programming I.
Fonts are covered in great depth, focus is on the many ways that fonts can be created and used in various functions. There are six major and quite different printing situations. Very little information is found in other texts on just how to print in various situations. This book rectifies that deficiency. Details of scaling and the use of various mapping modes are illustrated, including the construction of a ruler. Both list and tree controls are presented in a variety of ways and uses. The document view architecture is reviewed and then greatly expanded upon in a variety of programming situations. Details of just how the document and views are dynamically created by the framework are covered as well. Methods of handling WYSIWYG are presented, along with how to handle word wrap and justification of text. Image processing is detailed including how to handle printing an image in many different ways. Coupling your application to databases is presented both using the ODBC classes as well as the older DAO classes. Printing database based reports is covered as well. An in depth presentation of control bars, dialog bars and tool bars is done. Complex document view handling is shown. How to create and work with enhanced metafiles is covered. The Internet accessing classes are presented along with a primitive ftp browser. Many fancy controls are illustrated along with property pages. From this point, alternative ways are shown using owner drawn controls and deriving your own CWnd based control to improve the control. This is then extended into how to write ActiveX controls. How to write DLLs is presented, winding up with how to deal with multithreading. On top of all this, the book is highly readable! See for yourself. This edition uses Microsoft’s Visual Studio .NET 2005 compiler and .NET 2008 compiler and .NET2010 compiler. All three sets of sample programs are included. If you have already purchased the book from the old site, click here to download the few minor changes needed along with the 2010 versions of the many projects or right click here and save to download a txt file of the changes only. Windows MFC Programming II comes in Adobe pdf files. One file contains the entire book. There are also individual chapter pdf files. All of the sample programs are provided as well as the test data needed for some of the programming assignments are provided. If you do not have the Adobe Reader, Get Adobe Reader by clicking this link.